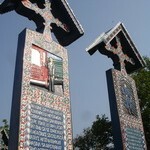 This monument is part of a gallery of honoring monuments that commemorate the Romanian participation in World War I, such as the Coronation Cathedral in Alba Iulia, the Mausoleum in Marasesti, the Heroes’ Cross on Mount Caraiman or the Tomb of the Unknown Soldier in Carol Park in Bucharest. The Triumphal Arch is located at the intersection of the road Pavel Kiseleff with boulevards Prezan, Alexandru Averescu and Alexandru Constantinescu, in Bucharest. 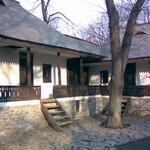 It was built between 1921-1922, under the supervision and guidance of the architect Petre Antonescu. He was hired by the Coronation Commission which was in charge of the appointment of King Ferdinand and Queen Maria as sovereigns of Great Romania. This was the name that Romania had between 1920 and 1940, after its unification in 1918 with the rest of Romanian territories: Transylvania, Bukovina and Bessarabia (present-day Republic of Moldova). Because of the short time until the event, only the skeleton was cast in concrete construction, the beautiful outdoor bas-reliefs being temporarily cast only in plaster. At the end of festivities in October 1922, the monument suffered severe degradation becoming ‘a stain’ on the perfect picture of ‘Little Paris’ (as Bucharest was known then). To get rid of this ‘stain’, many suggested it to be demolished, but the press brought the Triumphal Arch into the public’s attention, asking for its renovation. This was between 1935 and 1936 with much help from many companies of former combatants in World War I and the population. 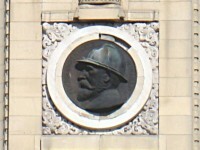 Petre Antonescu, together with a team of artists of the time, gave the building a new face, primarily by replacing the plaster reliefs with ones in marble and stone. The southern facade is nowadays beautifully adorned with two bronze medallions, depicting faces of King Ferdinand and Queen Mary, which replace the originals, destroyed by the communist regime after the 80s. 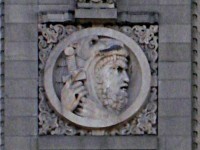 On the northern front, there are two medallions representing Manhood and Faith. Manhood is symbolized by a warrior with a sword and Faith by a young man with a cross. On the stones of the vault, there are the names of the places where battles were fought during First World War (Marasesti, Oituz, Cerna, Neajlov, Jiu River, Marasti, etc. ), and on the side facades, there are King Ferdinand’s proclamations to the people when the country entered the war and when he was crowned at Alba Iulia. Today, the Triumphal Arch is a symbol of Bucharest, being the place where Romania’s National Day (December 1) is celebrated each year through the well-known military parade. Inside it, there is a small museum, with the same theme (the Romanian participation in World War I), and above, there is a terrace where you can go and admire the entire city.